Is this the most heartwarming Lake District story so far this year? 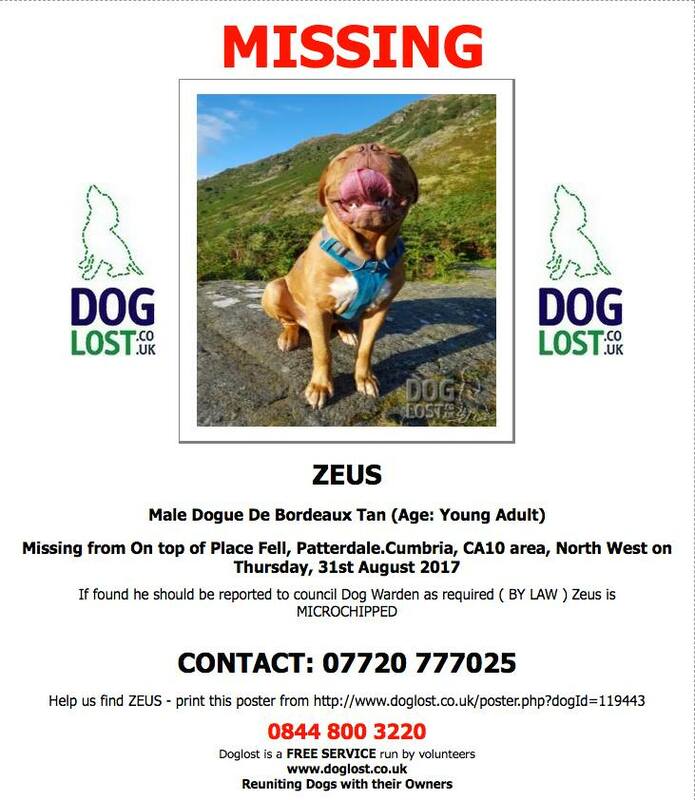 Early in the morning of Thursday 31st August, Tony McDougall took his beautiful Dogue de Bordeaux – Zeus – up Place Fell, over Ullswater. Although Zeus had been on lots of walks to build up his fitness, at ten months old, this would be his first fell walk. Tony is a keen fell walker and was looking forward to sharing his beloved Lakeland fells with his canine companion. But not far into their walk, something happened to spook Zeus, who wrenched his lead out of Tony’s hand and disappeared out of sight. Tony was distraught, searching for his canine friend high and low until it got too dark to look further. Camping out on Place Fell and searching each day for Zeus without success, Tony contacted his breeder to ask for advice. He had taken extra time off work but he’d used it up, and now had to return, broken-hearted, to his home town of Teesside. His breeder contacted Sarah Towers, a local dog rescuer, herself the owner of a Dogue de Bordeaux. Sarah posted a plea for help on social media, and over the next few days, the story was shared extensively. But as the days became a week, hopes were fading. Sarah did everything she could to keep the story in the media, and organised an official search party, planned for Sunday 17th September: two weeks and two days into Zeus’s disappearance. In the meantime, Tony, his owner, was camped up on Place Fell, and searching for him every day. Drone operators were flying over the area Zeus was last seen, but no one could find him. Zeus had simply vanished. All hopes were pinned on the official search. But then Sarah had a thought. She remembered seeing lots of posts about Jez Starkey – a local guy who liked to work out, and walk the fells without a shirt on. With a very fit physique, his photos in local walking and Lake District social media groups had caused a bit of a stir. Whilst the comments were mainly positive, Jez had also had some less than favourable remarks too, and at one point, had even been excluded from the largest Facebook group, I Love the Lake District. Sarah just knew that Jez would help. She contacted him through Facebook, and found he was on holiday in Barcelona, but he promised to be in touch the minute he returned to the UK. As soon as Jez got back on British soil, he posted on his personal Facebook profile, asking for help in a search for Zeus; his gym friend and fell runner, Adam Briggs, responded. They decided not to wait for the official search, but knowing time was of the essence if they had the slightest chance of finding Zeus alive, they set out at first light the following morning. “I just had a gut feeling we’d find him,” Jez says. “We were just determined not to leave the fell until we had”. Parking Jez’s van in Patterdale, they set off up the track to up to Place Fell, calling Zeus. Every now and again, they stopped to listen, and finally they heard it – a faint bark. Could it be Zeus? After calling and listening some more, they eventually pinned down the source of the barking to an area called Rooking Gill, under Steel Edge. This is when Adam’s fell running made all the difference – as they summited Place Fell, Adam zig-zagged all the crags whilst Jez checked every nook and cranny. All the while, the men were shouting and whistling for Zeus, occasionally being rewarded by another faint bark. At this point, Jez and Adam met some walkers who told them they thought they had heard barking coming from an area covered in deep bracken. Spurred on by the hope it could be Zeus, Adam ran up the right side of the ghyll whilst Jez took the left, wading through the chest-high bracken, shouting and whistling as they went. Suddenly, Adam shouted – he’d found Zeus. Zeus’s lead had been severely tangled in the bracken. He was clearly scared and exhausted, and could only move around two feet in any direction. There was a small stream just six feet away – tantalisingly close for a thirsty dog. Jez had saved him a chicken sandwich and he wolfed it down, together with two protein bars, clearly starving after 14 days – and nights – on this lonely fell. It took Jez and Adam almost 20 minutes to untangle Zeus’s knotted lead from the bracken, so firmly had it been entangled as the poor dog had struggled for his freedom. Finally he was free, and they took him over to the stream he’d been so close to for so long, where he could have a lovely long drink. As he did so, the men examined him, and could see Zeus had lost a lot of weight, but amazingly, seemed relatively bouncy and strong, in spite of his ordeal. He was happy in fact to walk down the fell without any assistance from Jez and Adam, still pulling at the lead: a real testament to his fitness level. Arriving back down in Patterdale, Jez and Adam had no phone signal so asked at Patterdale Post Office if they could use their phone. Jez phoned Sarah, knowing she was waiting anxiously for any news. Sarah looked at her phone when it rang, not knowing whether it was going to be the best, or the worst news. As soon as Sarah put down the phone from Jez, she called Tony, Zeus’s owner. “He was ecstatic, just screeching down the phone”. Sarah arranged to take Zeus to her own vets – the Westmorland Veterinary Group in Kendal – to get Zeus checked over. “They were fantastic”, says Sarah. Whilst Zeus had definitely lost a lot of body weight and needed two large ticks removed, he was otherwise unharmed; a relief to everyone. He’d survived by drinking rainwater and was very lucky that the night-time temperatures are still way above freezing. Nevertheless, the vet was amazed at the condition he was in, fearing the worst after hearing Zeus’s story. “He’s such a lovely big soppy dog,” says Sarah, with feeling, “after all he’d been through, he still had a lovely personality and a bit of bounce. I was half hoping his owner didn’t want him back that night so he could have stayed with me for a bit!” She jokes. With Tony working offshore, it was his brother Dave who met Sarah and Zeus, and the reunion followed in the Co-op car park in Kirkby Stephen. He bounced over to Dave joyously and was met with a great big hug: “they were definitely very pleased to see each other”, recalls Sarah. The men have certainly sparked lots of media attention; The Landgale Chase, Ambleside were first to show their appreciation for their heroic actions by offering them a meal as their guests. No doubt Zeus has been spoiled rotten in the days since his discovery and rescue. There must have been some dark times for this lovely dog, out on the cold fell, night after night. It’s such a heart-warming story with a fantastic, happy ending, and we wish Jez, Adam, Sarah, Tony, Dave and of course Zeus, the very best from all of us at AshdownJones. Next StorySelling Your Home in Autumn?